This article by Zoe Stojanovic-Hill was originally published in full in Honi Soit. An edited extract is reproduced below with Zoe’s permission. Chris Kiley and Barry Peak, founders of the Valhalla Cinema, made their first foray into independent cinema at Melbourne. Zoe takes up the story. Chris had been watching the New Arts Cinema at 166D Glebe Point Road for years, since it housed the first Australia production of the Rocky Horror Picture Show, and pounced soon as the owners put the building up for rent. ‘I thought that was the ideal location because it was so close to Sydney Uni,’ Chris says. In its heyday, during the 1980s, the Valhalla was an unholy sanctum for a lot of Sydney Uni students. Glebe was a scruffy suburb, packed with student sharehouses, and young locals would head to the Valhalla to watch cult, classic, and arthouse films — to indulge in bad taste, to drink the tangible nostalgia. Perhaps the Valhalla was popular with 20-somethings because it was sufficiently outrageous and sufficiently homey; it catered to a cohort swept up in the angst and inspiration of early adulthood, who occasionally wanted to pull back into childhood. Young people could depend on the Valhalla to show sordid films that had been censored, and subsequently ditched by other cinemas. They could also attend 24-hour sci-fi and Woody Allen marathons, dressed in pyjamas and draped in sleeping bags, and receive free bacon-and-egg rolls in the morning. 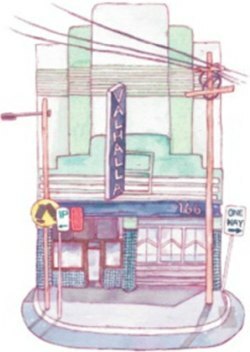 For the quirkier Sydney Uni students of the 80s the Valhalla was, true to its name, pretty damn glorious. In 2005 Chris realised, with a jolt of sadness, that the Valhalla ‘could never be a goer again,’ the SMH reported at the time. A number of factors contributed to the Valhalla’s demise. The rise of DVDs, and primeval forms of online streaming and internet downloads, led to a living room cinema boom. Mainstream cinemas morphed into gargantuan multiplexes. The Valhalla crew transformed the upstairs of 166D into a second cinema in 1994, but Chris estimates that, by then, Hoyts Broadway boasted eight screens. Mainstream film distributers began to encroach on arthouse territory, effectively poaching in the field of independent distributers. [Chris] closed the cinema in 2005 and sold the building to a property developer in 2006.